Ohhh goodness, guys. Bear with me on this one. The task was not easy and I’m not confident in how well this wardrobe will suit her. 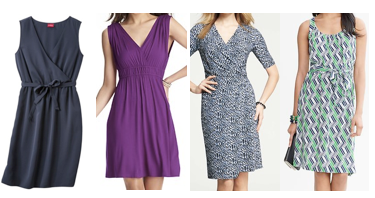 Let’s just say, petite women, I feel your shopping frustrations. I’ll explain why below. Leanna’s style preferences are SO fun and exciting, so I wanted to give Leanna a colorful, funky wardrobe full of lots of patterns, but I also had to juggle finding pieces that would fit her petite frame and flatter her figure…and hopefully at reasonable prices. The difficulty was that there aren’t as many options for petite women, and whatever was in stores at this time tended not to be as fun and exciting as I think Leanna could do. I did my best, but I Just couldn’t find as many pieces for her that I had envisioned. Instead I relied more on accessories to incorporate that pop to the outfits. Some of these items are pretty expensive (compared to what’s usually on this blog, at least), so please understand that this is not a list of specific items that Leanna should buy as it is more a list of types of items she could look for. Almost all links are for petite sizes but often have petite and regular options. Shopping links throughout the post below. Since Leanna is concerned about her midsection, I hoped for tops with structure built in, like an empire waist, a faux-wrap, an open neck, or darting or seaming in a “C” shape at the waist to create definition for her, but honestly the options available with those characteristics were mostly kind of boring. I ended up just choosing some pieces with more pattern and color that I hope will work for her shape. I could at least find tops with open necklines to elongate her petite frame, and top #4 has an empire waist which should hit the narrowest part of her, right under her bust, and flow down to conceal anything she’s worried about. The black blazer will be a great staple for her, particularly for work and for nights out. If you click to the one above you can see it has some seams that will nip in and create more definition for her upper body. “Make the clothes do the work for you,” say Stacy and Clinton. I love denim jackets and cargo jackets for on-the-go moms because they’re durable for when you’re with kids, but they can also be chic and worn for other occasions that don’t involve kids. The cargo jacket I listed has strings to nip in at the waist too, also helping create some definition in the waist. 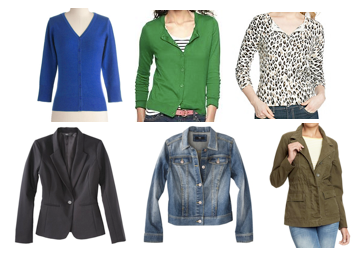 Cardigans are also excellent for moms (and for work) because you can move around really easily in them. Since Leanna didn’t seem to be scared of prints, I thought a printed cardi would be great for her. Whether it’s animal print, stripes, florals, or a fun geometric one, a printed cardi will be an instant piece to add interest to plain basics. The goal with the skirts was to add some volume to her lower half to balance out her top half with skirts that come straight down or a little away from her body at least around the knees. Also, for someone who is petite (correct me if I’m wrong) I’ve read that a good rule of thumb is for skirts and dresses to hit just above the knee, or at least at the knee. That should help elongate the leg line. There were quite a few skirt options, but since this is just a starter kit wardrobe I went with ones that could function in at least two, if not three, of Leanna’s lifestyle activities. I also looked at skirts with pleats and a-lines but the particular options I saw didn’t seem like they could serve dual purposes. Similarly to skirts, I chose pants that would go from her hip and make a nice straight line down to add some volume and balance out her top half. Also, since Leanna’s lower half is smaller, her pants can be lighter to draw attention to them. 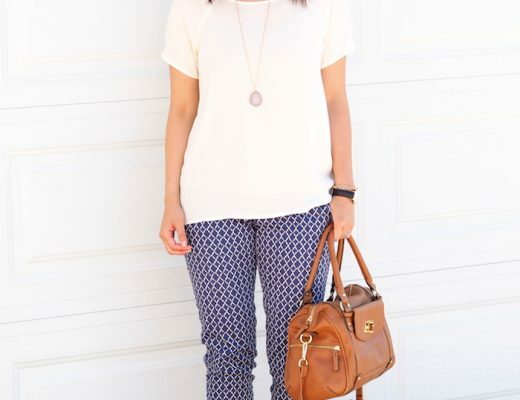 Grey trousers will be a great work staple for Leanna. I looked for a lighter or medium shade of grey. Straight legged jeans in a medium-wash. I’d prefer something even slightly lighter for Leanna than the ones I showed, but that’s what I could find. 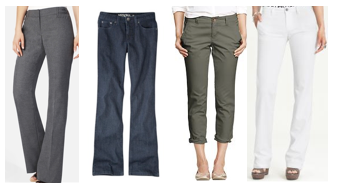 Olive kahki/cargos is always a plus for time with kids, but I could also see these dressed up with heels. White jeans...I just threw this one in there even if it might not be practical with little kids. But you never know, that doesn’t scare some people! She has such a thin lower half that white straight legged jeans would look so great on her! Faux-wraps, v-necks, empire waists, and a-line skirts. Like I mentioned above with tops and skirts, these are exactly what Leanna needs. The wraps and empire waists will create definition for her, the open necks will elongate her neckline, and volume at the bottom of the skirts will balance out her upper half. I think each of these dresses will serve her in two to three of her different lifestyle activities too! The possibilities here are endless, but I chose fun colors for her. And honestly, looking at her style preferences on Pinterest, leopard pumps and striped flats might be mild for her! She could totally rock a zebra print wedge! 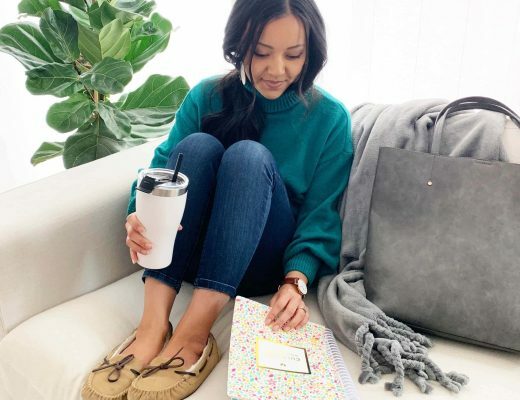 But the point isn’t the specific pieces…the point is to incorporate pattern and funkiness into her outfits by using printed shoes, colorful jewelry, and colored/patterned scarves. Seriously guys, I’m wiped from shopping! This one was really difficult to do, especially online, because like I said, I’m not confident that this will suit her style preferences well. Usually if the person is in front of me this is a good starting place but we get to tweak things if my hunches don’t work well. Without having her actually in front of me for feedback and that kinda stuff I wasn’t quite sure about everything so I hope this works out for her! Thanks for reading and I hope you enjoyed. Your encouragement is much appreciated! Win $100 to Outfit Additions! Wow, just reading this made me tired for you. I know how hard it is to do my own posts, let alone a post like this for someone else! 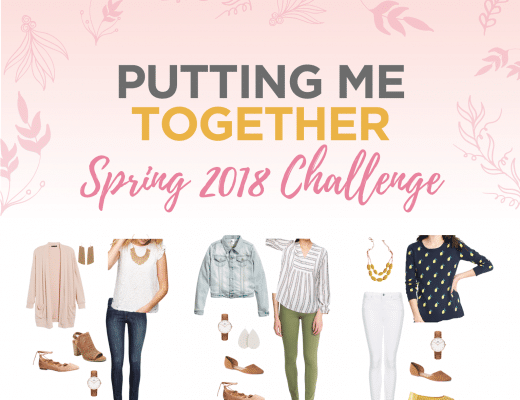 You did an amazing job though — all of these pieces are so great and make a great starter wardrobe! Sanding ovation for you!! You did great, picking clothes for someone via the Internet, you get ten cool points just for trying. I thought the tops, dresses and skirts you chose spoke to me the most, loved them all. Nice job! Oh my goodness, Leanna is a lucky lady! As someone who creates similar posts for people, I'm so impressed with the amount of time that I know you spent on this. It was super thoughtful and practical! I loved seeing how you pulled a whole wardrobe together. I also liked your comment that this is a "list of types of items she could look for". Makes for a great learning tool for the rest of us, too. Your blog is so full of helpful advice. Find flattering, stylish, affordable pieces is hard enough- but add in the petite or tall factor, and assembling an outfit becomes an extreme sport! I'd love to see some wedges added in- I think they would pump up the style, and would also keep up with such a busy woman. As someone who has a very similar body type to Leanna's, I have to say that you did a fantastic job! I was looking at most of those pieces and going, "EXACTLY"! Those are the kinds of dresses, skirts, and pants that I find flattering. Thanks for the timely reminder that just because so many other people are rocking dark skinnies doesn't mean that I need to abandon what works so well for me. P.S. I don't wear skirts above the top of my knee– just a personal modesty thing– and I find that a hem that hits anywhere in the kneecap area works well. Even if the hemline is at the bottom of my knee, it works. Audrey, I enjoy your 'blog, and I really liked not only seeing the clothes you picked for Leanna, but the fact that you described why you chose them. I'm impressed that you not only posted them all together at the top, but then grouped them into "tops", "skirts", etc. and talked about them later in your post. My figure has some similarities to Leanna's, so I appreciated the adjectives you used to describe, for example, tops and pants you chose for her. But I really enjoyed seeing all the *pictures* of the clothes, too! This post would have been 90% less interesting had you just used words to describe your suggestions; putting pictures up really helped me see what can look good together. Thanks for all your hard work! Whew! Thank you for chiming in, Kelly. That's really helpful to hear! Thanks for your feedback and encouragement, Margo! I'm really really glad all of that is helpful. 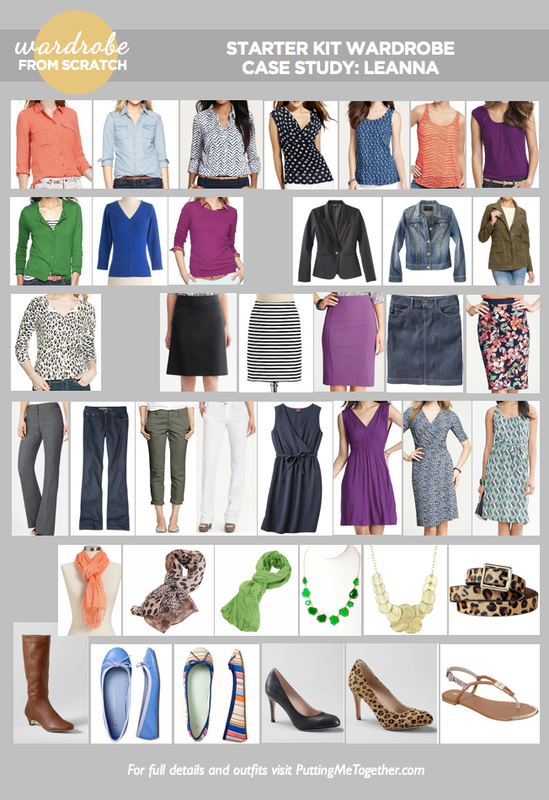 I really enjoy reading your blog and you've given me lots of inspiration to review and renew my own wardrobe. The job with Leanna's wardrobe is impressive. Amazing! 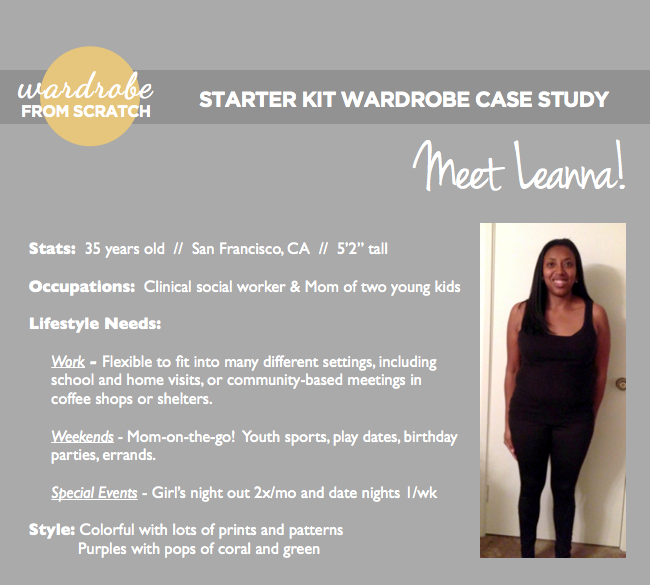 Loved how you explained why you picked each piece for Leanna…kinda like Clinton and Stacy's rules!! Love this feature on your blog and can't wait to see the next one!! I LOVE your wardrobe from scratch posts. I know they have to be TONS of work, but I really appreciate seeing a small wardrobe that can be mix and matched so beautifully. This is one the best wardrobes I've seen. Lots of variety and a similar body type attracts me to this one. Can't wait to see the outfits. This is fantastic – I love the colour palette you chose for her. I think it will look awesome on her! Thanks for the vote of confidence! I have case study submissions coming out of my ears right now from when I asked for them months ago, so I am not in need of any. Sorry! Don't get me wrong, Audrey, I love your blog. But this post seemed sooo negative. Like it was such a chore and misfortune for you to 'help' Leanna by constantly referring to how hard her figure was to dress. I mean that's the while point she came to you and it's not her fault she has the figure she does. I feel like the post could have gone a long way in celebrating her figure. Even with ladies who I think would be impossible to dress, Stacy and Clinton never say anything negative about how hard it is to find her clothes. Hey Jenn, I'm sorry that that's how you read this post. The feeling of difficulty was not in reference to Leanna or as a fault of her body but actually on her behalf regarding the limited clothing options that are available in stores. It's not at all that I think her body is impossible to dress–I actually don't think that one bit–but it is that I don't think that the current options in stores are great for her. My frustration was in wanting to be able to give Leanna more but that I felt unable to with the current options in stores. And in that sense, I have heard Stacy and Clinton express their frustration that there is a lack of options for petite women who aren't stick thin. I apologize if my mention of it being difficult or me being tired came off to you in another way, but please know that that was not the sentiment behind my words. Hi Audrey! I have been following your blog for a weeks, and I am really impressed! I have actually revisited my closet, and realised for the first time,that I actually do have 'something' to wear. You are my style inspiration. Thanks for sharing. Audrey, I don't think you need to feel frustrated in the wardrobe choices you have picked for Leanna. Just by looking at the gallery of outfits that have been created with what you chose I think you did a very good job. I'd be willing to say she can get quite a lot out of this starter wardrobe. And the fact that this is just a starter wardrobe that she can build on even further is amazing! I have a similar frame to Leanna's and I think I should add that skirts should go far above the knee, then they'd hit us at the widest part of your thigh. I learned that the width of the leg where the skirt hits sets the percieved leg width for the part that's hidden. Thanks to Audrey, and all of you, for your comments and styling recommendations! Audrey was spot-on with my style and color scheme! I loved how she talked through the different options and why those styles would be both flattering to my body type as well as my lifestyle. There were quite a few of the recommendations that I have in my wardrobe already – that's how deadon she was! I think that's pretty amazing given what little information Audrey really had to work with. What's great is now I know how to add and build a wardrobe including many of the pieces I already have. There was not one recommendation that Audrey made that I did not love and they all looked like me. I don't know how you do it, Audrey! But you have a special skill. I can't tell you enough how much it means to me. Thanks so much, Lauren. That means a lot coming from you! Oh, whew! Thanks for the feedback, Andrea. It's very helpful to hear from someone who shares a similar body type as Leanna and know that this was helpful somehow. Thank you for taking the time to comment! Happy Birthday, Leanna! Hope you have a great day and fun time shopping! I think you misinterpreted her meaning. As a petite I do find it very frustrating that I cannot try on clothes in stores because they only have petites online. Prices can be higher too because there are some stores that just do not carry them at all. I used to work in a department store. 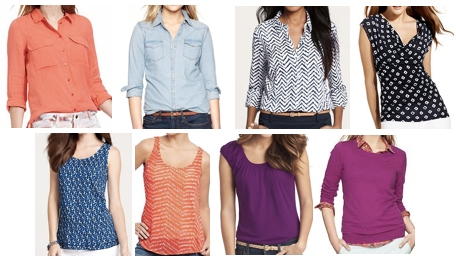 There were fewer options for petites than women who were average height. Even among the petite sizes, some designers catered to very small frames. So, yes, I agree. It can be hard to find what you need in a petite size. Audrey, I love what you've suggested for Leanna! great ideas and thanks for this site. I would really like to see more of how you encorporate accessories and shoes with outfits. That is an area i have difficulty mixing and matching. Audrey, I love your blog. The blog is candid and very informative. I am a petite too and have recently taken the plunge to find clothes that fit me the most flattering way. Which as you stated isn't the easiest thing to do. You are my inspiration for the mission. If I ever get to blog my efforts, can I bug you for advice? As someone who is 5'1", I must respectfully disagree about skirt length. I can either wear mini skirts (mid-thigh) or maxis, but anything in between makes my legs look shorter. Love the other suggestions, though! Can you show pictures of Sophie and Leann's outfits?